Blackhawk! holsters are quickly becoming an industry favorite among law enforcement professionals, US Military, and serious shooters. Blackhawk's Serpa Close Quarters Combat (CQC) holsters are trusted by serious shooters as the perfect retention holster for duty/open carry ensuring the the weapon doesn't accidentally leave its holster. The SERPA CQC retains a firearm with its patented SERPA Technology lock™. 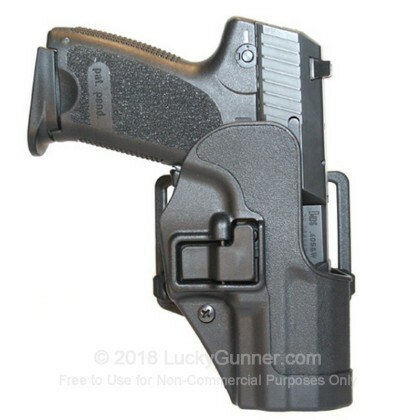 This lock automatically engages the trigger guard upon holstering your pistol and will not let go until you release it. The release is made by using your normal fluid drawing motion, with the trigger finger beside the holster body. Through their patented revolutionary technology, Blackhawk has removed the need for ineffective thumb breaks or awkward middle finger releases which slow down your draw. If you're looking for a high quality concealed carry holster, then trust the holster that the professionals are using.